A few months ago, I met someone who is known as Olive on Twitter. She is assertive, kind, compassionate and honest. She also loves cooking and isn't scared to try out new recipes using uncommon ingredients. Olive follows a vegan lifestyle and likes to give restaurants and pubs the opportunity to blossom, while they concoct vegan dishes for her and her hubby (Popeye) to enjoy. It is this last point, which made me reach out to her. Olive and Popeye have been eating out in Manchester a fair bit, so I asked her to send me an article to share all the great vegan eats with you. I have been vegan for nearly 30 years and in the early days, dining out, was virtually impossible, unless we went to a vegan or vegetarian restaurant! How things have changed! Now there's with choices everywhere and one of my favourite destinations to visit is the fabulous city of Manchester where vegans are spoilt for choice. I have not managed to try all the lovely places, but I am having fun trying! tofu fish and chips”. 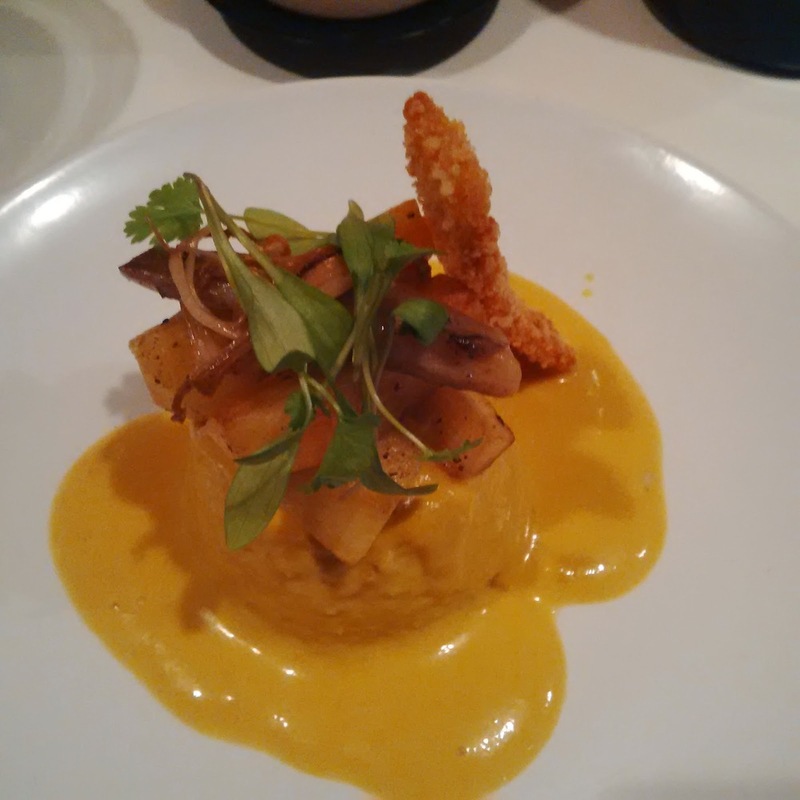 They can also provide vegan tasting menus if you are feeling in the mood. Another bonus is that the menus change regularly and the ingredients used are seasonal. V Revolution, on Oldham Street is an American inspired vegan junk food restaurant and proud of it. I have not had chance to try one of their vegan burgers yet, the cakes are awesome! Some are made in house and others are bought in. The one I had was amazing! It was the maple and pecan sponge cake made by Lily and Dilly. The photo does not do it justice! of four items, and who can resist the cakes? It's got one of the best vegan cake displays I have ever seen! In fact it's the only one I have ever seen. 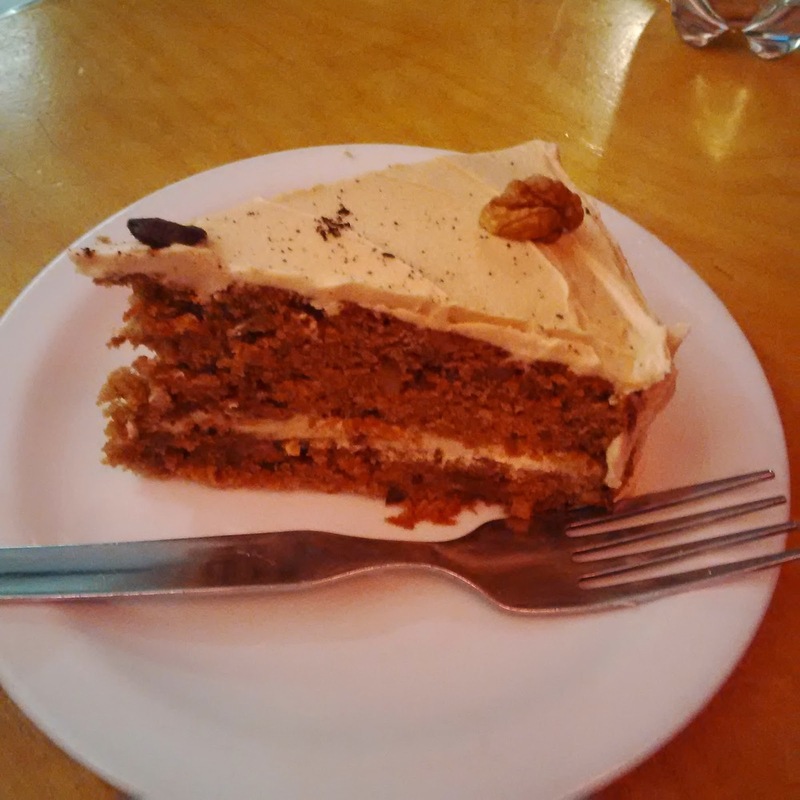 The coffee and walnut cake was to die for, I really need to revisit, just for the cakes! On the Eighth Day, on Oxford Road is a definite for any vegan visiting Manchester! There's a shop where they sell so many vegan products that my head was spinning! But there's also a cafe beneath, where I had the best ever vegan breakfast. or even a vegetarian establishment, but they have vegan options including a mushroom panini with almond and olive pesto, various soups and some fabulous cakes which I have yet to try. As all vegans know, if you’re stuck for somewhere to eat, Pizza Express is always a good place to choose and there is no shortage in city centre Manchester. My favourite, being on South King Street. Who can resist the Pianta vegan pizza or maybe a Veneziana without cheese?Pizza Express are always happy to swap toppings to make the dish vegan friendly, without charging extra. The Handmade Burger Company on Deansgate ) have several vegan options. Las Iguanas also on Deansgate have a separate vegan and vegetarian menu with loads of options. Tampopo at the soon to be re-opened Corn Exchange has vegan options on the menu. The Corn Exchange is opening in early summer 2015 after a £30 million refurbishment and vegans are in for a treat! New places like Wahaca (Mexican), Pho (Vietnamese) and Vapiano (Italian) will be coming to Manchester. Isn't it amazing to see the vast number of places that we can eat out at? Best of all, it's on the up! "If the entire world decided to become vegan tomorrow, a whole host of the world's problems would disappear overnight. Climate change would decrease by 25 percent, deforestation would cease, rainforests would be preserved, our water- and air-quality would increase, life-expectancy rates would increase, and our rates of cancer would plummet, so certainly, with that one action of becoming vegan you are quite effectively making the world a better place." Did you like this collection of reviews? If you’d like more of the same, click here to receive Plant Shift's monthly newsletter.